[giving] structure to web applications by providing models with key-value binding and custom events, collections with a rich API of enumerable functions, views with declarative event handling, [connecting] it all to your existing API over a RESTful JSON interface. Some research on integrating Backbone with Force.com’s REST API led to Piotr Walczyszyn‘s Backbone.Force, a plugin that handily adapts Backbone’s Model and Collection to our purposes, building on the ForceTK library to access the REST API. Many thanks to Piotr for developing Backbone.Force and open sourcing it for others to further build on! query: "WHERE IsDeleted = false" // Use a more selective filter in real life! Notice how each part of the code has a particular concern, and the View really just marshals the Model’s data into the DOM via the template? That approach is what allows us to build more and more complex apps without the descent into the tangled web of code. We could easily extend the app to, say, show the salutation (Dr, Mrs, etc) for each Contact by just adding that field to the model and template, without having to search through the app to figure out where we query the REST API and how we update the DOM. The remainder of the sample builds on the above foundation in a very systematic way. There is a View for the Contact list, that knows how to render itself (via a template) as a sequence of ContactView objects, a View for the Contact detail page, that, again, uses a template to render some of the Contact record’s fields and handles the chores of saving and deleting Contact records, and a Router, that handles the ‘plumbing’ between the various Views. // the latest data from Salesforce! // Route handlers for creating and modifying Contact records. By now, you’ll be eager to dive in and get this all working… The easiest way to try out the Backbone Mobile Pack is to follow the quick start for Backbone on Visualforce, or as a standalone Node.js or PHP web app. You can also inspect (fork, modify, etc) the source code in the GitHub repository. One thing you’ll notice if you do dive into the source is that the Mobile Pack currently uses Backbone.js 0.9.2 – Backbone.Force was written long before Backbone turned 1.0. We’ll look at porting it forward to 1.0 soon. 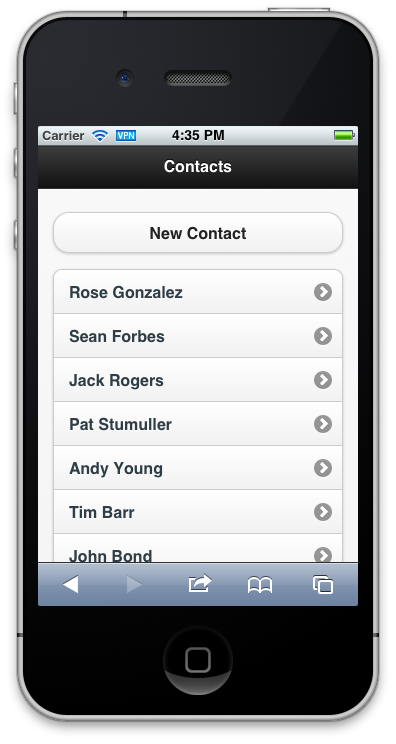 Go ahead and try out the Mobile Pack for Backbone.js, and its counterparts for jQuery Mobile and AngularJS. And let us know (here in the comments) which of the other MV* frameworks you’d like to see us target.